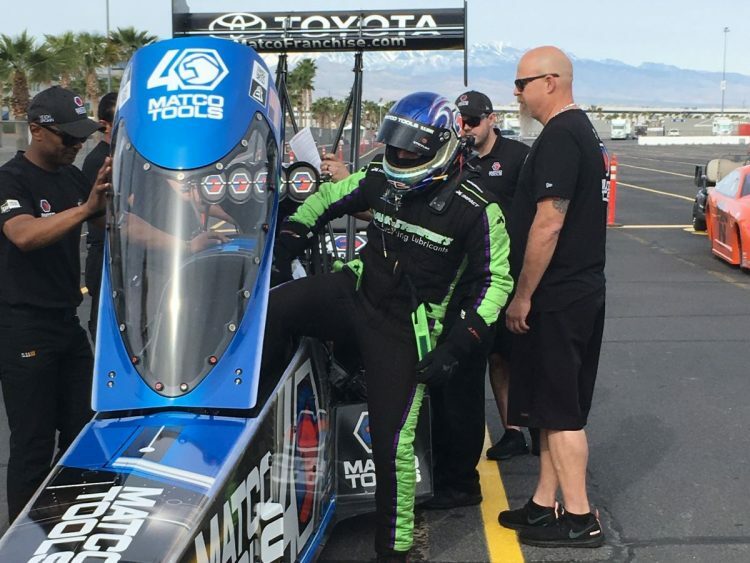 Matt Sackman, cylinder head specialist on the Matco Tools Top Fuel dragster and a Don Schumacher Racing developmental driver, successfully earned his NHRA Top Fuel license on Monday, April 8, at The Strip at Las Vegas Motor Speedway. Sackman, who has been part of the DSR family since 2013, first working as an intern on Antron Brown’s Top Fuel dragster before transitioning into a full-time position in 2014, licensed in the very machine he services daily while traveling the NHRA Mello Yello Drag Racing Series circuit. “I’ve been a crew member on Antron’s Matco Tools dragster since 2013 so to be able to get my Top Fuel license in that same car and have Antron sign off on my license was pretty surreal,” said Sackman, a 25-year-old graduate of Joliet (Ill.) Junior College where he specialized in precision machining. Sackman made three passes down the LVMS dragstrip behind the wheel of Brown’s 11,000 horsepower machine to earn his license. The first pass was a planned shutoff at 500 feet. He crossed the stripe in 3.832 seconds at 273-mph on his second lap and clocked a 3.851 at 312.78-mph during his third to meet NHRA’s Top Fuel licensing requirements. Top Fuel fan-favorite Dom Lagana joined Brown in signing-off on Sackman’s NHRA licensing paperwork. The aspiring Top Fuel competitor’s journey to licensing in the sport’s highest level of drag racing began nearly 15 years prior. He got his first taste for speed while wheeling his family’s Jr. Dragster in 2005 and competed in the NHRA Jr. Drag Racing League until 2011. During that time, he connected with Brown who was helping launch his son, Anson’s, Jr. Dragster career, which later led to Sackman becoming an intern on Brown’s Top Fuel machine. Since 2015, Sackman has pulled double-duty, living the crew member life on the 24-race Mello Yello circuit while also honing his driving skills in a Top Dragster and Top Alcohol Dragster. “I started driving my family’s Top Dragster in 2015 and competed in a handful of events that year,” said Sackman. “Hangsterfer’s came on board initially as a one-race deal in 2015 and from there it grew into a full-time partnership of our family’s dragster in 2017 which eventually led to them sponsoring the Top Alcohol Dragster I’ve been driving. I’m so grateful to Mike Ditzel and the Jones family (of Hangsterfer’s) for being such strong supporters of my driving career. “I’ve known Antron, and (Matco Tools dragster co-crew chiefs) Brad Mason and Mark Oswald for more than 10 years at this point. Getting licensed at Vegas yesterday kind of felt like things were coming full circle because that’s where I got licensed in the Top Alcohol Dragster category in 2015,” added Sackman, who has already claimed a No. 1 qualifier, event win and runner-up finish just three races into his young Top Alcohol Dragster career.